I’ve been practicing my Haskell skills by solving programming challenges. During my ACM-ICPC competitor days, I used to practice a lot on SPOJ. The good thing about SPOJ is that it accepts submissions in many many languages (most other sites are limited to C, C++, Pascal and Java). There’s a Brazilian fork of SPOJ, called SPOJ-Br. I preferred using this one because it contains problems of Brazil’s national high school contests, which are usually easier. One of the problem I was just trying to solve boils down to: Given a list of numbers, one in each line from stdin, read the first line as N. Then return the sum of the next N lines. Repeat until N = 0. This problem is pretty straightforward to do in C++, but for the Haskell version I started getting time limit exceeded (when you program takes more time than the problem setters expected). I had no clue on what was causing this, but I happened to read the Profiling and Optimization chapter from Real World Haskell. This chapter is particularly well-written and introduces a lot of new concepts and tool, which will be the focus of this post. Now, let’s profile to get more details. 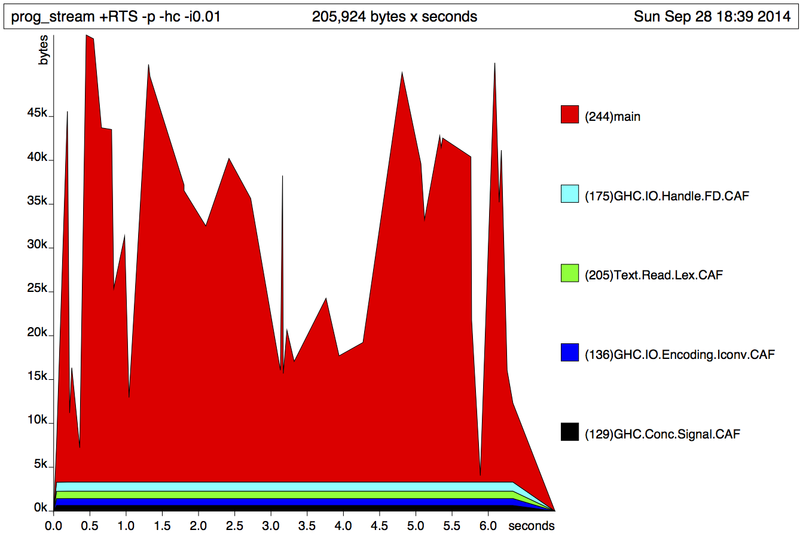 Like in gcc, ghc has different levels of optimization, and in this case we’re using O2. The -prof tells ghc to turn on profiling. alternatively, we can use the -auto-all flag for adding automatic annotations to all functions, which is also less intrusive (no code modifications). We can turn on the profiling for CAF’s using the option -caf-all. -fforce-recomp will force recompilation. ghc might not compile the file again if the source code didn’t change, but if we’re playing with different flags, then we want to force it. Haskell compiled code is linked to a run time system (RTS) which offers a lot of options. To be able to provide this options in when running a program, we have to use the flag -rtsopts. With this report, we can see things like the amount of memory used and the time spent by the garbage collector. From the above, we can see most of the time is being spent on the main function. The spikes in the chart represent the chunks of lists. Ideally haskell could be completely lazy and stream the lists instead of loading it up into memory. If we run this code this won’t actually improve the memory footprint comparing to the previous attempt. The reason it that at each recursion call, because we’re doing it lazily, we keep a reference to the variable cnt until we reach the end of the chunk to compute the sum. A way to force strictness for cnt is using a language extension, the Bang Patterns. We just need to do two changes in the code above: add the macro at the top of the file and in the g' function definition, use !cnt. This will force cnt to be evaluated strictly (instead of lazily). Note that now the maximum memory usage is 45K, 2 orders of magnitude less than the 3M of our initial version. Even though changing the code we managed to use less memory, it didn’t improve the runtime significantly (both were around 4 secs). It’s time to investigate other tools and strategies. Another idea to improve the performance of a program is to get the optimized code that is generated by the ghc compiler before transforming it into imperative machine code, which is know as the core. It’s still a valid Haskell syntax, but it’s very hard to read. In , the authors suggest investigating the core to identify where the compiler is not optimizing properly and then modify the original code to help it. According to , those are used by ghc for later stages of compilation. For inspecting the code though, we could remove the annotations. Primitive types and boxed types. Most Haskell types are high-level abstractions that only point to data in the heap, but to not contain the actual values. For one side, it leads to cleaner programs and simpler APIs, but on the other hand it adds an overhead. When optimizing code, the compiler will try to convert types to the primitive versions (unboxing), so it’s rare that we’ll need to work with primitive types directly. By convention primitive types are ended on the # sign. For example, comparing to C primitive types in parenthesis, we have Int# (long int), Double# (double), Addr# (void *). We also see the GHC.Prim.State# type. GHC.Prim contains a collection of unboxed types. In particular, the State monad has a primitive type and it appears in the generated code because the IO monad (used in the function main through interact) can be written in terms of the State monad . Gonzalez studies the core in more depth in this blog post, especially in regards to the IO monad. It’s an interesting read. Still stuck in the running time problem, I decided to ask a question on Stack Overflow and even though the main question was not answered, someone suggested using ByteStrings instead of Strings. Chapter 8 of Real World Haskell actually talks about ByteStrings as a cheaper alternative to Strings . The reason is that Strings are essentially a List of Chars, so we have 2 layers of abstraction, while ByteString is a data structure specialized for strings. One limitation of ByteStrings is that it only works with 8-bit characters. For Unicode handling, the most common alternative is Data.Text, which also has a low overhead compared to String and can handle Unicode . Converting the code was basically changing the Prelude function calls dealing with Strings to use the ByteStrings. Since most of the functions have the same name, we had to qualify them. Running this code yields a running time of 0.4s, roughly 10x faster than the String version. This was enough to make this program pass in the online judge. This post was motivated by a slow running program when solving a programming challenge. 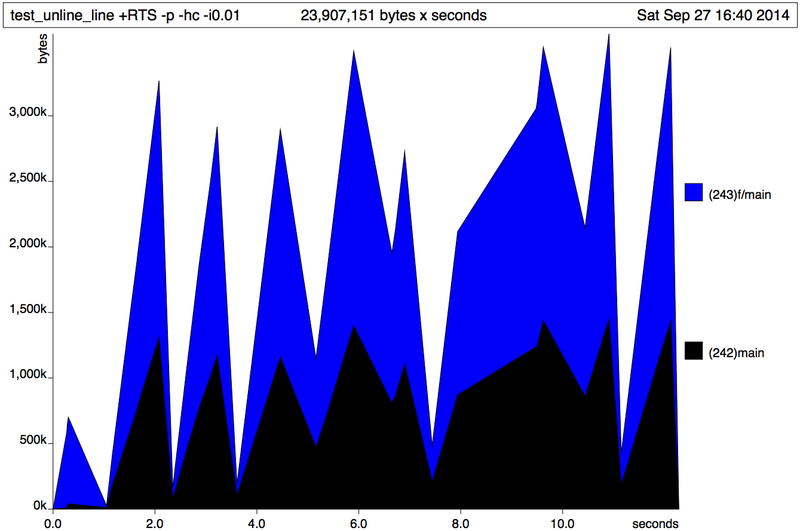 While looking for ways to improve it, we learned some techniques for profiling code. We also learned about the core, which is a optimized (and hard to read) Haskell code generated by ghc during the compilation. It turned out it the improvement necessary to speed up the code was only swapping String with ByteString. Henceforth, I’ll make sure to always use ByteStrings, at least when writing programming challenges solutions. Upon writing this post, I stumbled into Zyang’s posts, which seem to delve into great detail on the core functionality. I didn’t have time to read, but I’ve bookmark those for future reading: Unraveling the mystery of the IO monad and Tracing the compilation of Hello Factorial!. In this post we’ll talk briefly about Monad Transformers. Chapter 18 from the Real World Haskell inspired this, but as usual, it was a bit hard for me to digest. The best source so far for this subject was the Haskell wiki . In a high-level, monad transformers are monads generated by combining monads into a new one (thus transforming monads in monads). Intuitively, it does so by using the analogy of wrapping, as we have for Monads, but monad transformers wraps monads inside monads. 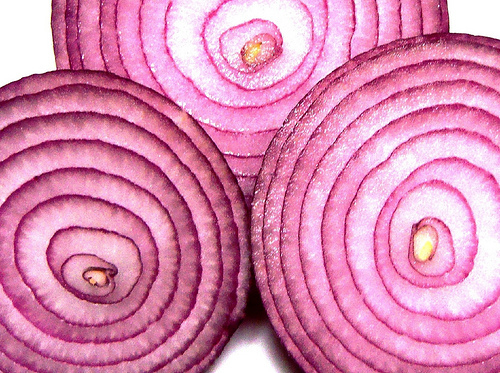 Thus, Dan Piponi makes an analogy of onion layers . The idea of transformers is to avoid boilerplate in common scenarios where two monads are used in conjunction. We’ll present some monad transformers, all follow the pattern where two monads are combined, the first one is fixed, and the other is generic. The fixed monads are Maybe, List and State and their correspondent transformers are called MaybeT, ListT and StateT, respectively. The Writer and Read monads also have corresponding transformers, but we’re not talking about them here. As in , we’ll be more detailed in describing the MaybeT which is the simplest of our examples, and for the other two, we’ll limit ourselves to the definition and a brief explanation. Let’s start by recapping the Maybe monad, as seen in a previous post. Remembering, return wraps an element in the monad and >>= is the bind operator, which takes an element wrapped in a monad, extracts it, applies a function f, which returns another element wrapped in the monad. Monads can contain other monads and one particular useful combination is of a monad containing the Maybe monad. While we can accomplish that by regular use of monads, we can also avoid some boilerplate code by having a special type that encodes this combination, in this case the MaybeT data type. We can think of MaybeT data type as a 3-layer wrapping. The inner layer being the Maybe monad, then a generic monad and then the actual MaybeT wrapper. The first part is Just, which encapsulates the inner element in the Maybe monad. The second return encapsulates in the generic monad m and finally we encapsulate in the MaybeT monad. de-encapsulate the three layers of monads before running f on it. Let’s review the list  monad, as we saw in a previous post. For the return definition, we wrap (a, s) in using the m monad, by the use of return function of m.
The bind operator, x applied to s will return m (a, s). We extract if from m by using the <- operator and then run the function on a, but since (f v) returns the result wrapped in StateT, we need to extract it using runStateT, and finally wrap into m again and then into StateT. All the monad transformers can implement the MonadTrans interface, which basically defines the function lift. After understand better the concept of Monad transformers, Chapter 18 from Real World Haskell  becomes easier to digest and it’s quite interesting. At one point, it discusses the real power of combining multiple monad transformers (for example, the generic monad in MaybeT could be another monad transformer, say WriterT). This “equips” a given data type with traits corresponding to the underlying monads (in the example the optional nature of Maybe and the logging capabilities of the Writer monad).